Glenys Rogers has always been a musical adventurer. At 17, the singer/songwriter/percussionist cut her teeth with the Los Angeles based 12-piece experimental-funk ensemble, Cocu. 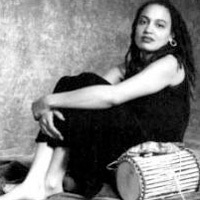 She's honed her skills recording and touring internationally with a range of award-winning peers: six years with Frances Awe's Nigerian Drum Ensemble, featured soloist and lead vocalist for Mickey Hart's Planet Drum, percussionist and backing vocalist for Tracy Chapman, and, most recently, as backing vocalist for Beck. With a strong presence on the national and international music scene, she's earned overwhelming praise by her colleagues and much critical acclaim.